Senator Joe Manchin has an upcoming event in Charleston at 9 AM on Wednesday. The rest of the state is blank. 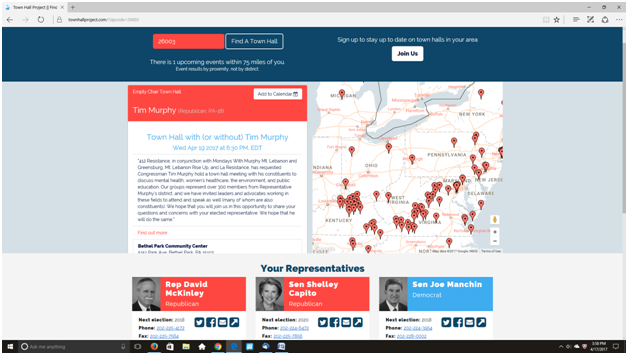 Neither Senator Capito or Representative McKinley (or for that matter, Reps. Jenkins or Mooney ) have scheduled a town hall. I tried to find the Capito and McKinley schedules. Capito was on a Martinsburg talk show this morning and with Hoppy Kercheval on Metro Radio later. (I listened to the Kercheval interview and it wasn't very long and there were no tough questions.) One of her staff talked to a veterans group on Friday. For McKinley, I could find no meeting with constituents since the get-together with half-a-dozen or so veterans last Tuesday. (See three posts down for a picture.) I guess for McKinley and Capito this is what representation is all about when you're afraid to actually engage with the people you represent.